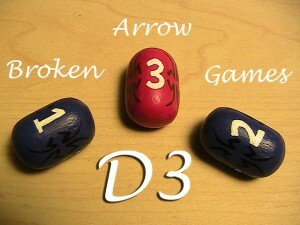 Broken Arrow Games has a Kickstarter campaign up and running for a new D3 that they say is the first real 3-sided die. The game is looking good, your on the attack, your friend is starting to sweat as your wizard picks a spell. You cast fireballs and cause d3 wounds.....d3 wounds? Where is your d3? Has this or similar ever happened to you? As a long time tabletop wargamer I have been frustrated by this often. Sure you can just roll a 6 sided dice and either count 1-2 as 1, 3-4 as 2, and 5-6 as 3 or even just keep rolling until you get a 1, 2 or 3. But there is just something about this that doesn't seem right. So finally one night I decided to create a working three sided dice. Have any of you ever tried the down right laughable d3s already out there? Like the one shaped like a pyramid that rolls even worse or the long triangles that have 2 sides with no numbers and therefore must be re-rolled if it lands on them then you know that a true d3 does not exist. Until now that is!